HONG KONG, Feb. 1, 2019 /PRNewswire/ — I-Mab Biopharma (I-Mab), a China-based clinical stage biopharmaceutical company exclusively focused on the development of innovative biologics in immuno-oncology and autoimmune diseases, today announces that it has entered into a memorandum of understanding (MOU) with Hong Kong-based Bio-Cancer Treatment International Limited (BCT) to jointly explore and investigate new therapeutic potentials for BCT’s arginine depletion therapy in autoimmune diseases and cancers. Under the terms of the MOU, I-Mab and BCT will work together to explore the potential of arginine depletion therapy in autoimmune diseases, as well as biomarkers in arginine and other immunologic targets in the tumor microenvironment for experimental cancer immunotherapy. 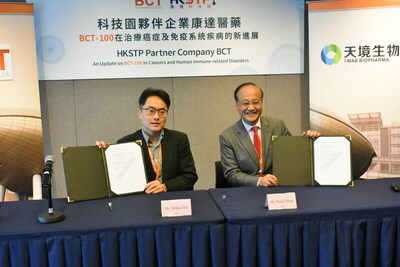 In conjunction with this development collaboration, I-Mab also plans to establish a translational medicine lab in Hong Kong to conduct exploratory biomarker work on BCT’s lead drug candidate, BCT-100, as well as a number of important assets in I-Mab’s own pipeline. Over the longer term, I-Mab will consider expanding the lab into a full-functioning R&D center in Hong Kong, taking advantage of the local scientific talent pool, clinical resources and government initiatives to encourage life sciences development. "BCT is a biotech company with an established unique focus on targeting arginine metabolism to treat cancers and immune disorders. We are especially impressed by BCT’s ability to bring about collaborations among like-minded academic groups and clinician-scientists, to really understand, exploit and expand the therapeutic potential of something as vital as amino acid metabolism. We look forward to working closely with BCT to explore creating synergy with our pipelines. The partnership also provides I-Mab with an opportunity to set up a world-class translational medicine hub in Hong Kong, with further potential to develop clinical presence in Hong Kong," said Jielun Zhu, Chief Financial Officer of I-Mab. "BCT is extremely honored to be working with I-Mab’s team of highly experienced biotech professionals in developing first-in-class biologics in autoimmune diseases and cancers to find ways to collaborate. The proposed biomarker study is very important to BCT both as precision medicine to identify cancer patients that would benefit the most from the BCT-100 treatment and also to apply the arginine depletion therapy to a wider patient population," said Derek Wong, CFO of BCT. Founded in 2000, BCT’s product candidate portfolio comprises few pegylated recombinant human arginase 1 (pegArg1) candidates, which can potentially retard tumor growth and ultimately cancer death. Its leading candidate, BCT-100, is currently in phase I clinical trial in the US for the treatment of arginine-auxotrophic solid cancers and phase II clinical trials in the UK for the treatment of acute myeloid leukemia (AML) and pediatric cancers. www.bio-cancer.com.